James Ensor, Demons Teasing Me, Museum of Fine Arts, Ghent, © Lukas Art in Flanders vzw, SABAM Belgium 2017. 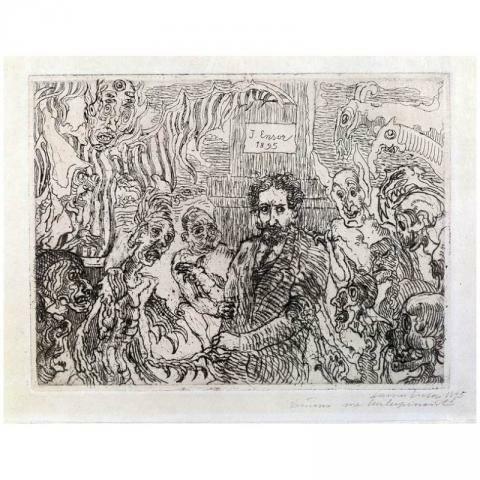 With his artistic imagination, James Ensor often crossed the line between art and reality. One of his favorite identification figures was St. Anthony, on whom Ensor also refers in the etching Demons Teasing Me which is based on an 1888 drawing. A hand-colored version of the etching from the Berlin Kupferstichkabinett's collection is currently featured in the exhibition Hieronymus Bosch and his Pictorial World in Berlin (until March 19, 2017). From both sides, the anxiously looking artist is plagued by demons, monsters and skeletons. Physically, they don't seem to do any harm. However, a tombstone, rising in the background above the self-portrait - signed and dated -, leaves no doubt about the fatal outcome. Who are those tormentors Ensor so self-deprecatingly introduces? They're his inner demons. On the one hand: his critics, whose incomprehension for his art Ensor wasn't able to ignore until the end of his long artistic career - which was very successful from the turn of the century onwards -, on the other hand they're the old masters, Ensor's predecessors and icons. The demons and devils in the midst of which he appears as St. Anthony i.a. are to be interpreted as the relationship between modern art and the old masters, and as reflection of the problems and possibilities for an artist to put himself in a/any tradition. Ensor's art is linked to the rediscovery of the Dutch-Flemish tradition with Bosch, Bruegel, Rembrandt, Rubens and Jordaens as protagonists, which he seeks to continue. Bosch's phantasmagorical worlds had continued to be a source of inspiration for Dutch artists throughout the 17th century. The iconography of the tormented and attempted St. Anthony even grew stronger in the art of Bosch's successors like Pieter Huys, Jan Mandijn or the lesser known Frans Verbeeck, who in his semi-colored drawings developed a complex imagery and style while standing in the Bosch tradition. Ensor knows Flemish painting and is quite aware of its identity defining role for the young nation of Belgium, founded in 1830. He was well acquainted with the museum collections of Brussels, Bruges, Ghent and Antwerp, as well as with the works by Bosch successors like Huys and Mandijn. Ensor probably didn't see the Rubens exhibition in 1877, a visit to a show in Bruges in 1902 however, celebrated for the rediscovery of the Flemish Primitives from Van Eyck over Hans Memling and Gerard David to Pieter Bruegel, is possible. Bosch's monsters, the St. Anthony iconography of his successors, as well as caricature inspired Demons Teasing Me. 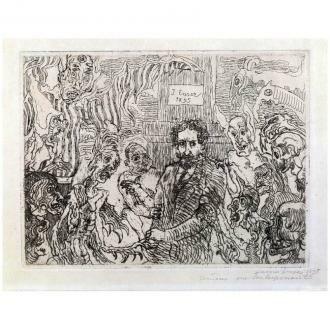 It is Ensor's fascination in ‘ars phantastica', the phantasmagorical, grotesque, and morbid humor that lead him to this genre. Little devils tormenting the protagonist are also to be found in George Cruikshank's medical caricatures which depict diseases as the devil's work. The most direct inspiration for Ensor's etching is J. J. Grandvilles Petty Sorrows of Human Life (1843). Bosch was the main inspiration for this long standing tradition. Particularly Ensor's later work features numerous Bosch-like hybrid monsters at the edges of the picture, and some compositions evoke the grotesque figures and the ornamental in the work of Bosch or Bruegel, but at the same time remind of microbes and bacteria through a microscope, one of which he used at the Rousseau's in Brussels. What sets Ensor apart from his contemporaries is his subtle, individual approach to models from different areas - not just visual arts, but also popular culture and literature. He adapts themes and motifs and synthesizes them with ‘inventions' of his own to new, repeatable and modifiable pictorial solutions. As is the case in Demons Teasing Me, which in the context of the Bosch succession and the tormented St. Anthony epitomizes Ensor's spot in a Dutch tradition, and in the 19th century as well has his individual, ironic-humorous approach to art. Ina Dinter is curator of the prints and drawings-section of the exhibition Hieronymus Bosch and his Pictorial World in the 16th and 17th Century (until March 19, 2017). To mark the 500th anniversary of the death of Jheronimus Bosch, and as the last of a number of some smaller and two major retrospectives, the Gemäldegalerie and the Kupferstichkabinett of the Staatliche Museen zu Berlin, show a studio exhibition displaying their holdings of Bosch originals, copies and Bosch inspired works.